Getting off to a start for the first event of the day. The boys open 400m sprint. It didn’t look like a great start for the day. It had been drizzling all night and the tartan track at the National Coaching Center was wet at 7:00 am in the morning. While rain had brought about some logistical issues, it turned the weather into a brilliant day for running and competing. Volunteers from Sindh Track and Field Club , PASHA, Alchemy Technologies, the Nest.ioand EGO showed up in large numbers at 8:00 am sharp. 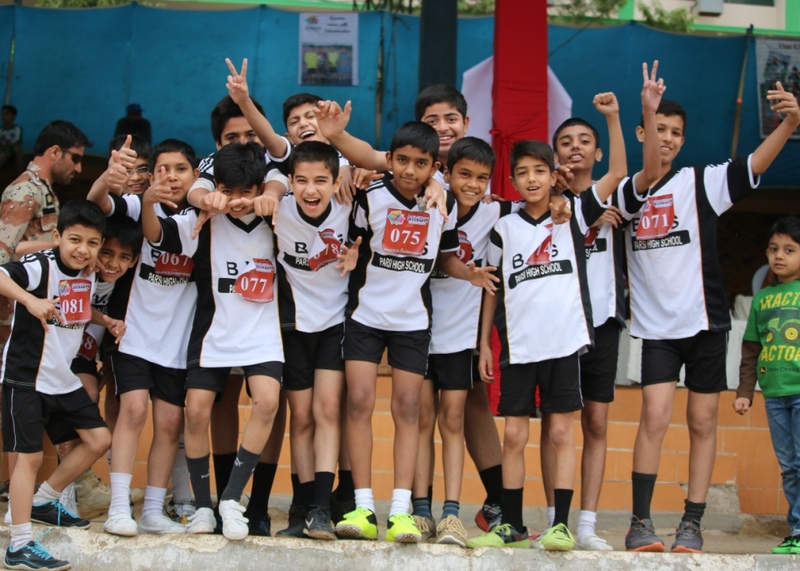 220 young athletes registered and were in attendance to test their mettle against Karachi’s finest 10, 11 and 12 years old. 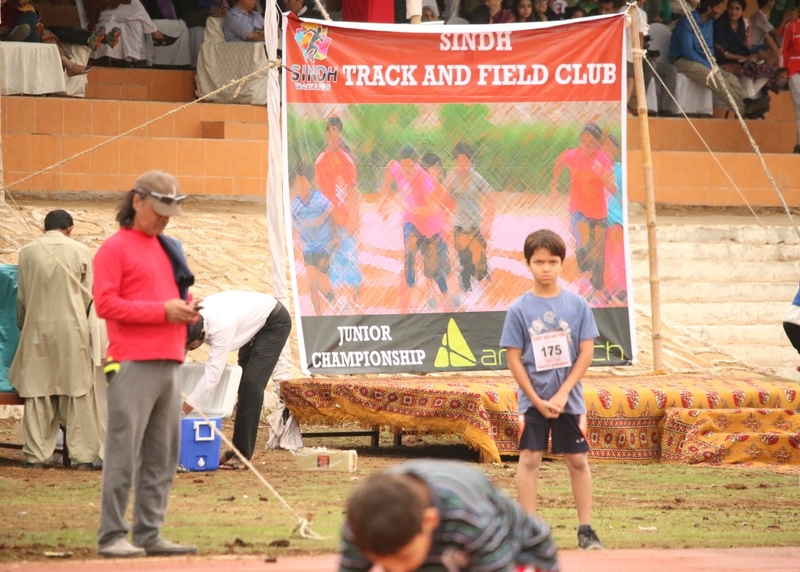 Shamir Danish leads Rayan Raza to win the 100m heat and the gold for the event to be crowned the fasted 11 year old in Karachi. 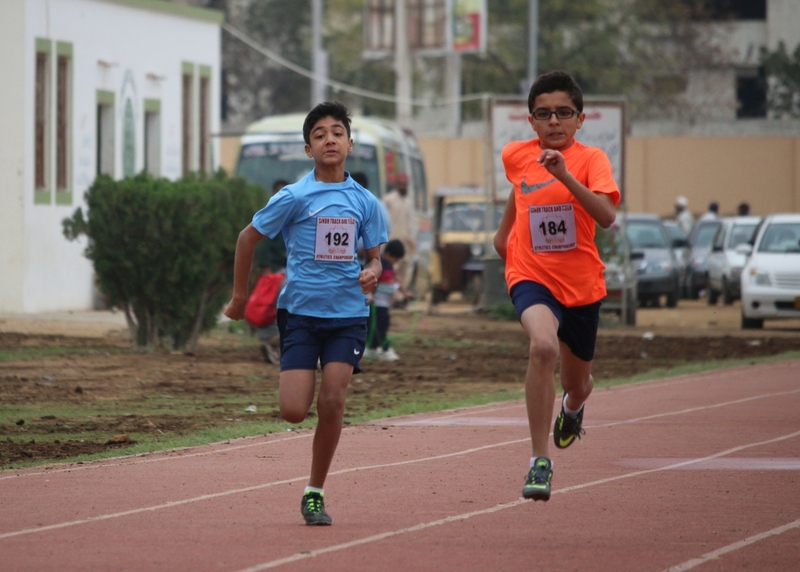 Shahmir Danish and Alina Humayun became the fastest 11 years old athletes in Karachi when they won their respective 100m finals at the Karachi Juniors Athletics championship at the National Coaching Center. 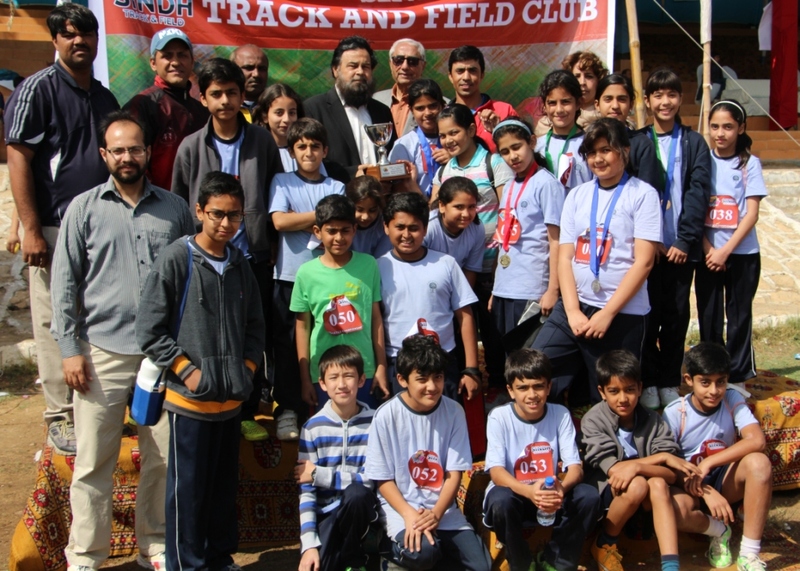 Organized by Sindh Track and Field Club, a private athletics training club, the championship on 28th February witnessed participation 17 junior schools in Karachi. 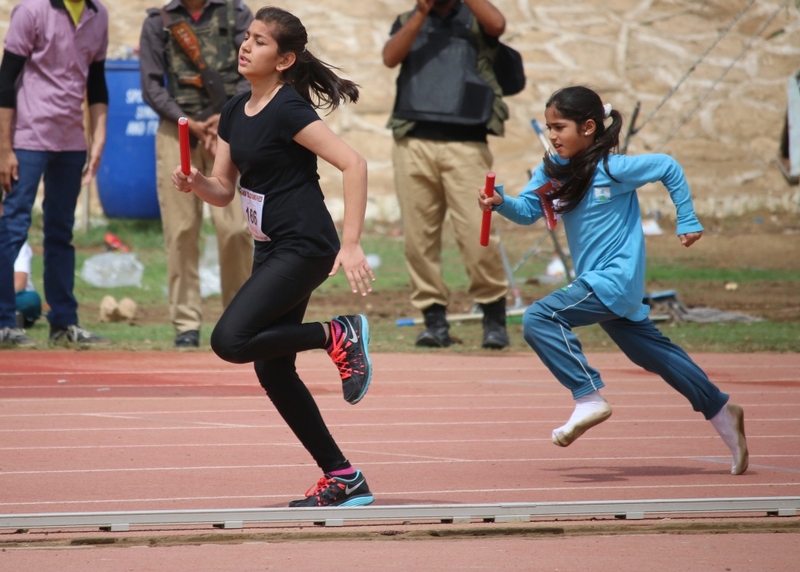 The Karachi Junior Athletics Championship was arranged by Sindh Track and Field club to promote young athletes and showcase their talent. There was certainly no shortage of talent, spirit or commitment at the athletics meet today including a number of shoe less runners who took full advantage of the freshly washed track to run barefoot and win. 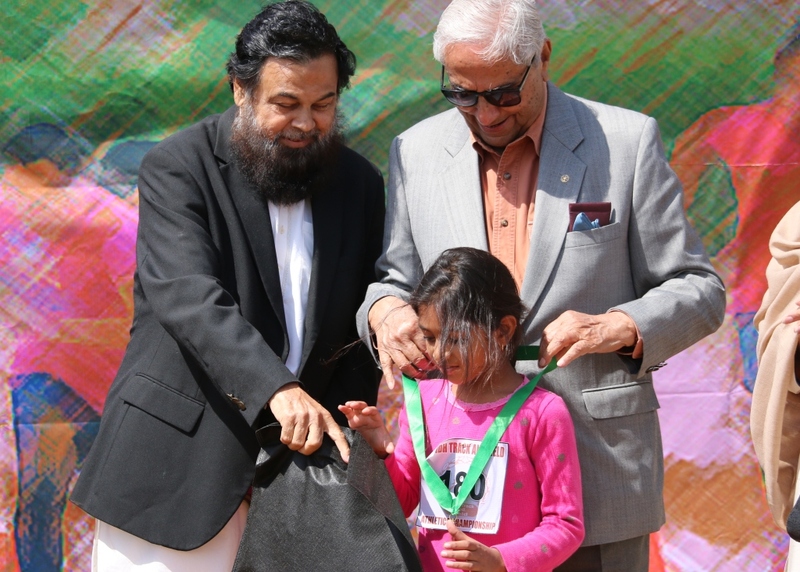 Amongst the many stars of the show was 9 year old Sana Alavi from Foundation Public School who won the bronze medal in 200m open sprint with a time of 36:02. To put that into context Sana ran a neck to neck photo finish with her STF fellow athlete Alina Humayun who finished second with a time of 35:56 seconds. Sana and Alina’s time is better than that seen at many inter house and inter school meets in the girls under 15 category. Sana Alavi with her bronze medal in the girls open 200m event. Pakistan’s golden age in Athletics ended in the late 60s. Till 1967 we would show up at any international meet and win. In the early 70’s we simply stopped winning at championships that count. There were some exceptions at the South Asian Federation games but our medal count against European and North American competitors essentially zeroed out. 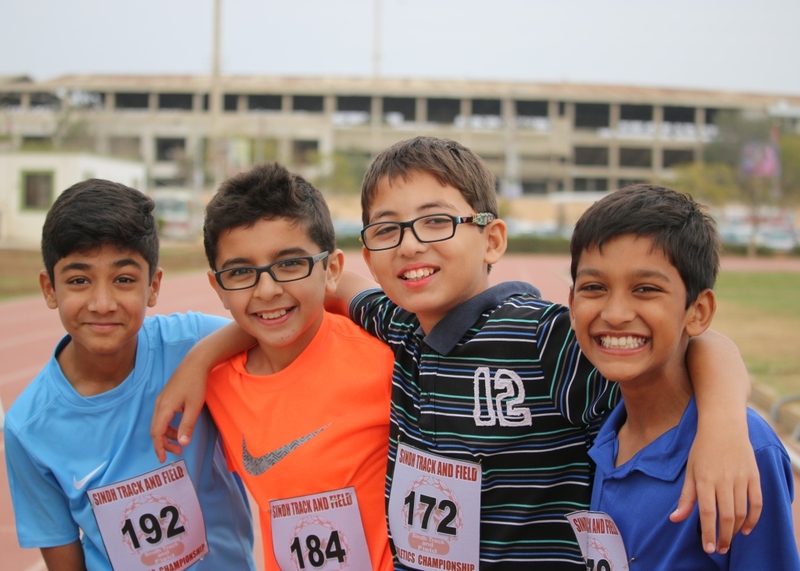 The team at Sindh Track and Field Club believes that the sooner kids start training for track events, the higher their chances of competing and winning at international and regional events. 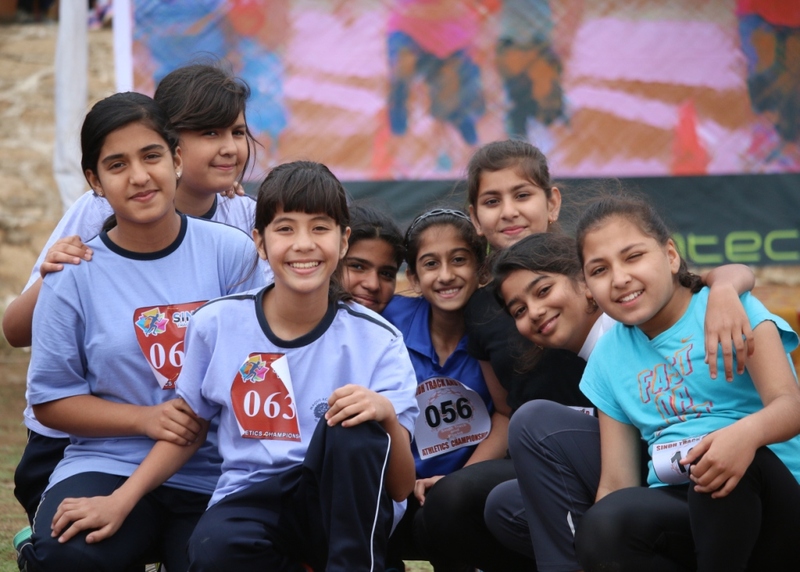 The view is the source of strong contention between the two school of thoughts that exist in Pakistan’s athletics training circles. BVS Parsi High School picked up the boys championship trophy while The Learning Tree school won the girls championship. Haque Academy team finished as the runners up for girls, while Reflections school boys team finished as the runners up in their category. The Haque Academy runners up team. Despite the tough competition between schools, many new friendships were formed on the track and the sidelines of the field. The girls from Haque Academy and CAS School really hit it off. New friends made on the tartan track. The two relay teams. Team Arpatech with the Haque Academy girls. Team Arpatech. The young guns who lead the field in 4x100m sprint. 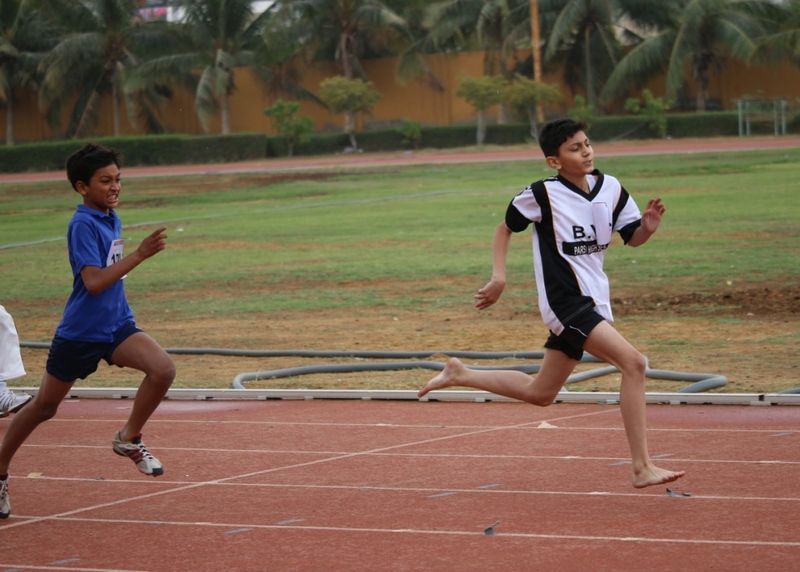 Salwa Farid and Shamir Danish from CAS school were declared the best sprinters of the championship. Shamir picked up two gold medals in the boys 100m and 200m sprints improving his personal best as well as breaking his school under 13 record in 200m (29.13 seconds versus 30.85 seconds). 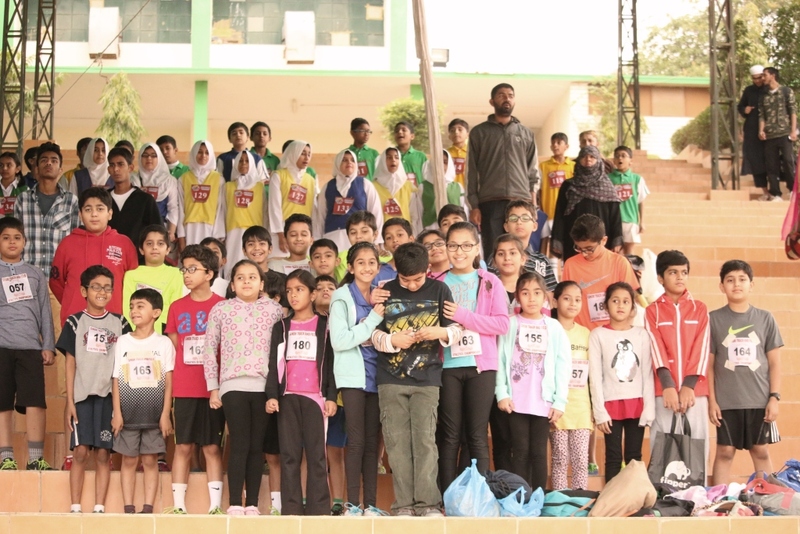 While Salwa Farid won two gold medals in the girls 200m and 400m sprints and broke her school record in the under-13 400m sprint (1:21:75 versus 1:25:96 seconds). 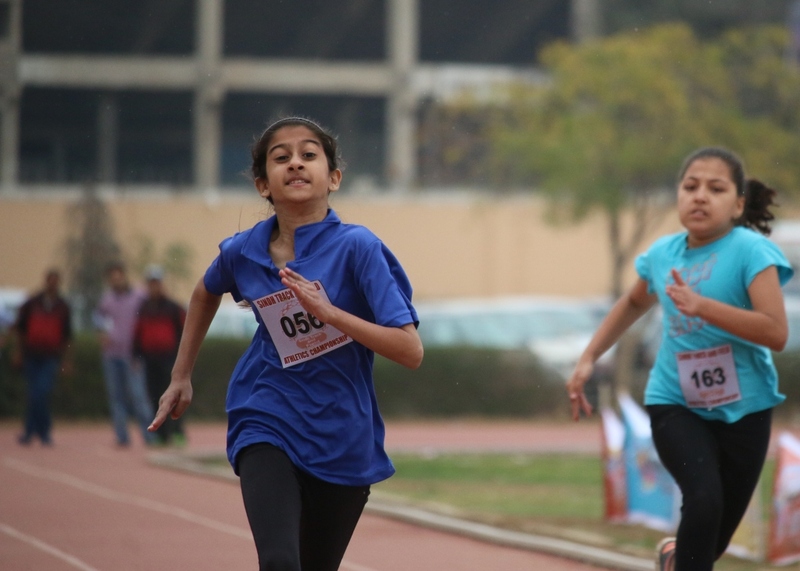 Undeterred by cloudy skies, a light drizzle and forecast of thunderstorm, the event was a refreshing display of colors, young spirit, athletic talent and energy. The championship was generously sponsored by Arpatech, Ego, Eastend, Asiatic, Shaheen and Alavi families. It was graced by the presence of a number of senior athletes, Rotarians and Mr. Zahid Rizvi, the President of the Karachi Division Amateur Athletics Association and the Vice Chairman of Sindh Amateur Athletics Association. Pictures: Credit – Jawwad Ahmed Farid. 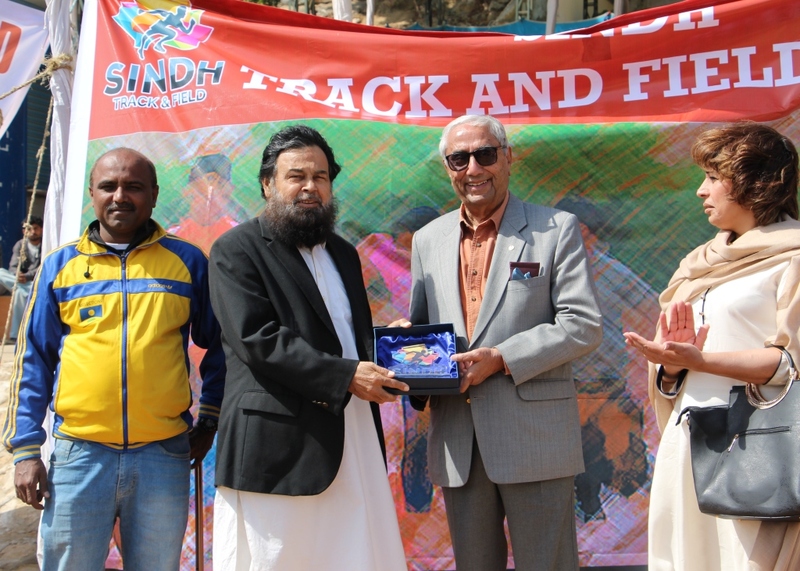 For more details about the organizers and the championship meet please see Sindh Track and Field Club.